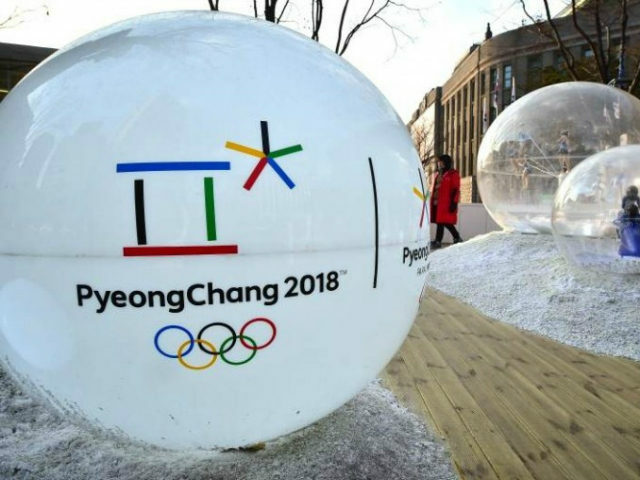 South Korea’s Prime Minister Lee Nak-yon announced Wednesday that Seoul had agreed to allow a “massive delegation totaling between 400-500 people” from North Korea to attend this year’s Winter Olympics in PyeongChang. The agreement is a result of direct talks between the two nations occurring this week, following an invitation for Pyongyang to send representatives to discuss a potential North Korean presence at the global athletic event. Leftist South Korean President Moon Jae-in has urged the two countries to reconnect diplomatically, using sports if necessary. He confirmed the presence of the North Korean delegation while noting that the details of their visit remain to be debated. Yonhap notes that the delegation would include not only athletes, but “athletes, cheering and performing arts squads, taekwondo demonstration teams and journalists” – and, of course, communist North Korean officials. Officials have not elaborated on which officials will attend, or which “journalists.” North Korea’s government rigidly controls all media outlets available in the country, most of which are used to publish vitriol against the United States. The Korean Central News Agency (KCNA) covered the talks with South Korea, in contrast, with rare measured language. “At the talks the north and south authorities discussed in earnest the principled issues arising in successfully holding the 23rd Winter Olympics in south Korea and improving the inter-Korean relations,” KCNA noted, listing the individuals participating in the talks on behalf of dictator Kim Jong-un. The text did not capitalize the name “South Korea,” however–a way of rejecting the sovereignty of that nation. North Korean officials also used the talks with Seoul officials as an avenue to threaten the United States yet again. “North Korea’s weapons are only aimed at the United States, not our brethren, China or Russia,” diplomat Ri Son-gwon told his counterparts on Tuesday as a means of reassuring South Korean officials. The two Koreas will reportedly follow up the diplomatic talks with a military meeting between the two sides. According to Seoul, the meeting will “focus on measures necessary for the North’s participation in the PyeongChang Winter Olympics.” These will be the first talks on a military level in three years; they have yet to be scheduled, though both sides are aiming for a date next month. The Trump administration has reacted to the recent talks with cautious optimism. “The fact that (the inter-Korean talks) happened, I think, is notable, and that such a step has not been chosen before by North Korea,” Gen. Vincent K. Brooks, the head of the U.S. armed forces in South Korea, said on Wednesday. In a press gaggle Tuesday, the State Department called the talks a “positive development” and expressed hope that North Korea would continue to open up communications to the world.